Gallery of emotions or significant features of a face. It is necessary to choose the most significant features of a face for correction of emotions by means of cosmetic art and facial make-up, as eyes or mouth or eyebrows in some cases are essential stylistic parameters of emotional expressions and manifestations of a woman. Quiet eyes and open mouth seem dismal as eyebrows express sad emotions. 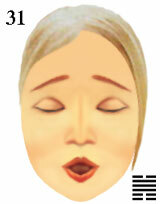 Sad eyebrows and open mouth seem inexpressible or unspeakable as eyes express quiet emotions. Sad eyebrows and quiet eyes can seem outspoken as the mouth expresses open emotions. Quiet eyes cannot hide revelation of feelings and grief of ideas. Absence of desires is caused by sad ideas, but feelings of the person speak about aspiration to sensual sensations. significant features of a face and cosmetic make-up.